We come back to the settlement of Wontuh again to examine the mechanism to make the spatial structure constant. Here, the road system is argued as an example of the constancy in the spatial structure. The road, an essential spatial element, should have been moved and widened in this village. The detailed story is as follows. In the 1940s when the elementary school was built at this village, a new narrow road was formed along the waterway called 'the marsh snail ditch' to link the settlement to the school. In 1953, the existing Main Road (north) disappeared by being incorporated to the lots which were outside of it, and the new road along the waterway came to function as the Main Road. The Main Road which had been moved this way was widened and paved in the 1970s, as part of the New village movement - its present width is about 6 m. At that time the government advised to widen Main Roads of rural villages for so called 'the Modernization of the rural area'. And then new farm machines as well as oxcarts practically needed wider roads. In this way the Main Road (north) was widened after being moved. The motive of movement was that the previous narrow Main Road could not be widened since lots were densely formed along both its sides. So they filled up a part of the waterway bordering the settlement to have straight Main Road with a certain width. 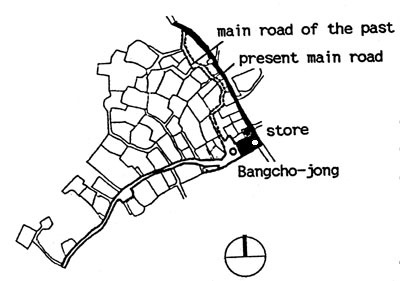 The movement of the Main Road accompanied a little change in the space-structural location of Bangcho-jong, the central facility located on the way from any house to the settlement entrance. And at the new diverging point of the south and north branches of the Main Road was located a store which had dual meaning as the social and the service facility. Since a new social facility, the store, was located at the point topologically corresponding to the location of Bangcho-jong in the past, as a result, the spatial structure continues without topological change. (Fig 10) The case shows that the function of the Main Road in the settlement, forming a boundary of the housing site and connecting major community facilities is sustained, though the road itself was changed. It is a good example that the spatial structure, the road system, is sustained functionally, topologically and structurally without change, in spite of the change in the spatial element. There have been several nationwide attempts to improve the rural indigenous settlements in Korea. Unfortunately, however, any one was not so successful yet. Such experiences merely left the lesson that any change in the settlement is nothing but the confusion under the pretense of improvement, without understanding and accommodating the logic and order of real life. The fact should have been recognized that the logic and order cannot be found just within individual houses but the spatial structure of the settlement. As an example, lets compare a traditional house plan and so called 'the Standard plan' prepared by the government which prevailed in Korean rural area for two decades till the middle of the 1980s. 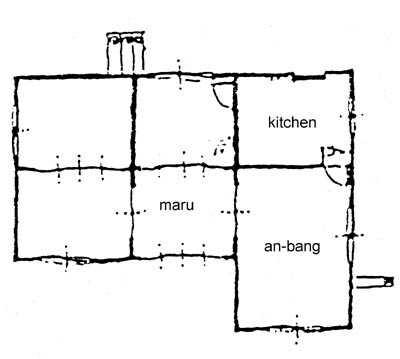 In a traditional village, Samsong-ri, located in the middle area of Korea, the old house plan and the Standard plan coexist, as shown in Fig 11. 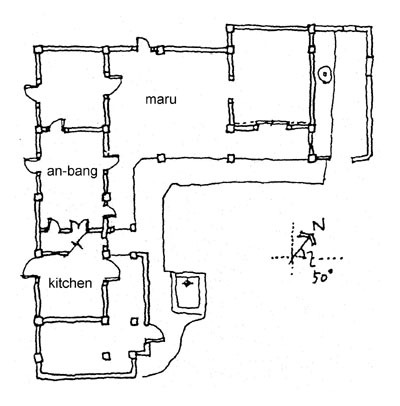 One of the differences between the two plan types is in the relative location of the kitchen. Unlike in the traditional one, the kitchen is laid rear layer in the Standard type. Traditionally the kitchen is used connected with the Inner Yard which is at the front of the house. So the housewife can have a visual contact with the main gate which usually faces the Sub-road and naturally surveil the outside of the house. This linkage of 'kitchen - Inner Yard - main gate - Sub-road' is not kept up in the Standard plan houses. According to a post occupancy evaluation on the settlement by the author23, there are much trouble in dwelling at the Standard plan houses. Thus many dwellers attached new small kitchens to their houses after occupation instead of using the originally designed kitchen. And the Inner Yard is not used actively and the back yard linked to the kitchen is actively used instead. In this respect, a trial to improve the traditional house with a new design has failed. This example shows that the change of a part of the house without the adequate structural modification in the settlement as well as in the house causes trouble. What is asserted in this paper is not that the spatial structure of the traditional Korean settlement is totally constant, but that its constant aspects should be respected. And a point is clarified that the spatial structure is relatively much more constant than the spatial elements composing it. This paper concerns the bases to sustain the spatial structure. As a consequence, it has been proved that the constancy of the spatial structure is based on two principles, hierarchy and sequence. In addition, the paper has reviewed the specific ways in which the traditional Korean settlement is regulated by these principles. The principles are closely related to the Korean tradition whose fundamental factors are the heritage in property including the land and the house, and the hierarchical social order critically supported by the right and duty to worship ancestors. The tradition has also been sustained for centuries. Through examining the traditional settlement Wontuh, it has been found that the places of basic elements such as the Main Road, the important community facilities, and the Family Head's house are sustained. Such places seem to offer datums to place other lots or houses. Therefore the basic spatial structure tends to be constant. In this way the constant aspect of the spatial structure is partly and directly attributed to the higher hierarchical elements. It should be noted that the frame of social order based on the Confucian value system in Korean rural areas is maintained, though it gets more and more potential to be changed. Accordingly, the community facilities including ceremonial facilities are used now though not so frequently as in the past. Thus, it may be concluded that the change of the settlement, as now, does not exceed the existing frame. Consequently the traditional Korean settlement maintains its cultural quality. Now, however, with the growing factors to cause change, there is the need to seek for the direction of change in the settlement space. In this context, Korean clan villages face a new situation which calls for the structural modification. So, it has timely meaning to evaluate the constant core of the traditional settlement. 23. Han, Pilwon & Lee, Dongrak, op. cit. * The titles of Korean references are translated into English by the author.